The Center for Long-Term Cybersecurity has issued a new report that presents a novel framework for navigating the complex landscape of artificial intelligence (AI) security. 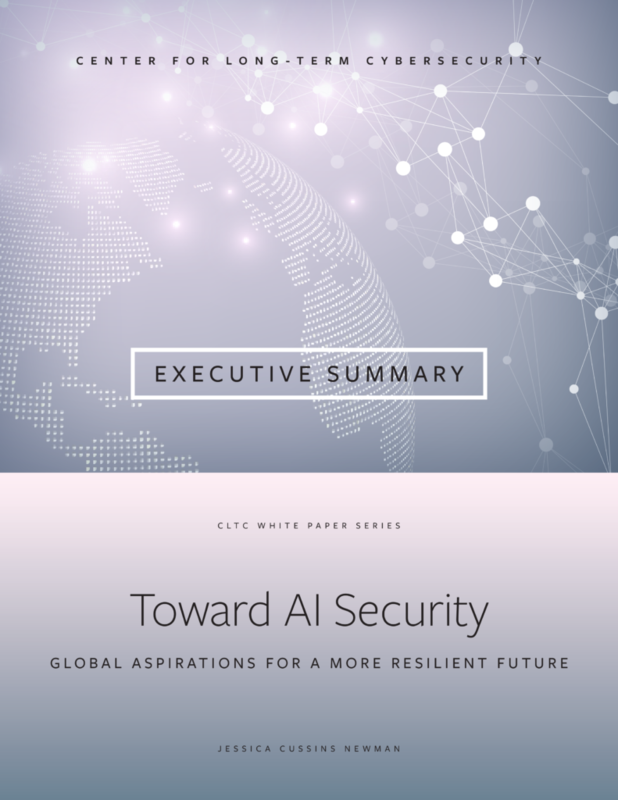 The report, “Toward AI Security: Global Aspirations for a More Resilient Future,” authored by CLTC Research Fellow Jessica Cussins Newman, provides a comparative analysis of emerging AI strategies and policies from ten countries: Canada, China, France, India, Japan, Singapore, South Korea, the United Arab Emirates, the United Kingdom, and the United States. Read an executive summary of the report here. Recent years have seen a significant increase in government attention to AI, as at least 27 national governments have articulated plans or initiatives for encouraging and managing the development of AI technologies. “Toward AI Security” uses a structured framework—referred to as the AI Security Map—to organize dimensions of security in which AI presents threats and opportunities, including the digital/physical, political, economic, and social domains. The map helps structure key topics that are relevant to AI security, and serves as a tool of comparing different nations’ strategic plans. Some governments—including those of France, India, and South Korea—are leading the way in acknowledging and preparing for the breadth of disruption likely to result from AI in the future. Only two priorities are shared by all ten of the countries surveyed: promoting AI research and development, and updating training and education resources. Countries have many additional opportunities to coordinate AI security strategies. For example, most countries are trying to address transparency and accountability of AI as well as privacy, data rights, and ethics. Most countries also prioritize private-public partnerships and call for improving digital infrastructure and government expertise in AI. The United States and China share many priorities for advancing AI, including international collaboration; transparency and accountability; updating training and educational resources; private-public partnerships and collaboration; creating reliable AI systems; and promoting the responsible and ethical use of AI in the military. Critical gaps in leadership remain around key issues. For example, only two (or fewer) national strategies address inequality, human rights, disinformation and manipulation, and checks against surveillance, control, and abuse of power. Based on the analysis of the gaps and opportunities in national AI strategies and policies, the report provides a set of five recommendations for policymakers, including 1) facilitating early global coordination around common interests; 2) using government spending to establish best practices; 3) investigating what may be left “on the table”; 4) holding the technology industry accountable; and 5) integrating multi-disciplinary and community input.